As these ideas and struggles evolved, I questioned aspects of the social orthodoxies of race, tribe, caste, colour, class, gender, culture, religion and so on, categorizations which reflected aspects of divisive social behaviour. In relation to one of these forms of totalisation, namely class, I was surprised to find after years of research, and contrary to my own understanding, that E.P. Thompson’s famous book The Making of the English Working Class had entirely overlooked the presence and contribution of Black leaders who were prominent in English working class struggles. But while The Making of the Black Working Class in Britain had been informative for students and general readers of 1987, for the next generation of those born and bred in Britain, as well as new immigrants from outside the ‘Commonwealth,’ a great deal is taken for granted. The fundamental rights (for example, those enabled by the Race Relations Act) affecting people at the workplace and in communities did not happen overnight. In fact, such rights became law as a direct result of insistent, bitter campaigns against racism and sexism waged by Black and Asian workers, especially in the 1960s, '70s and '80s. 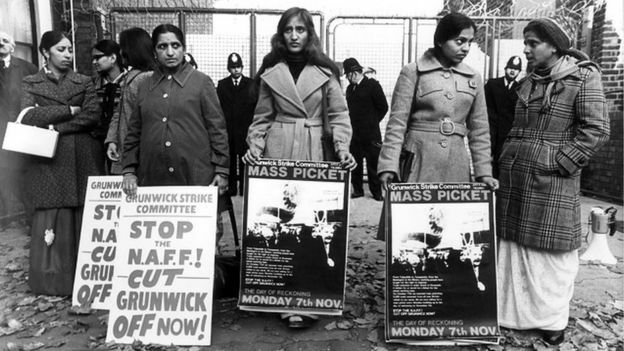 One of the defining struggles of this era celebrated its fourtieth anniversary last year: the Grunwick strike, a strike led mainly by Asian women at the Grunwick Film Processing Laboratories in Willesden, and which was recognised at the ‘Grunwick 40 Exhibition’ displayed in the Brent Museum and Archives at Willesden Library. At the time of the Strike, leading trade union activists like Arthur Scargill and Jack Dromey saw the struggles of these Strikers in Saris as symbolic of the fundamental right of a worker to belong to a trade union. In this respect, the Grunwick strikers have been likened to oppressed workers of an earlier era, such as the Tolpuddle Martyrs and the East End Match Girls. But this was not the tradition from which the Grunwick workers came. The emotional appeal to defend Unionism succeeded in getting the support of thousands of white workers to join the Grunwick picket lines, but that did not mean that white workers were there to support a strike by ‘Asian’ workers. Instead white workers, it was argued, came to the picket lines because they felt strongly about ‘defending the trade union movement.’ Thus the strategy that the Grunwick strikers had subsumed themselves to, was in effect, a denial of their own histories of autonomous organising and struggle. From the beginning of the walk out, they had been led to believe that mobilising white workers had to be their prime goal. And so, fourteen months later and with no victory in sight, the strikers had no recourse but to appeal to black workers in other parts of the country for support. Thus the history of Black workers in the twentieth century and their experience of trade unions in Britain, had forced them to create their own methods and means of struggle. As all previous black movements had done, the activities of black workers propelled ‘race’ and racism to the forefront and thus laid the basis for a powerful national and international linkage of Afro-Asian struggles; a source that remained largely untapped during the Grunwick Strike. As a consequence of this strike and others, Black workers formed autonomous organisations to deal with their various grievances. But with the passage of time, as social schisms were opening up, I began to examine the totalising effect of the social categorizations such as race, class, caste, colour, gender, culture and religion that had stymied individuals instead of freeing them so that they could move ahead in their quest for ‘equal’ rights. In this quest the stereotype had to be avoided. From my observation of society, it was (and is) clear that one size does not fit all. Thirty years on, depressingly we are still confronted with growing disparities in pay between black and white workers and the tendency of police officers to target Black youth in their stop and search operations. My authorship of The Making of the Black working Class in Britain and its publication in 1987 was a watershed in the evolution of essential ideas underpinning my literary quests (fiction and non-fiction) as I explored the art of writing. Art, I firmly believe, must reflect what is going on in society. And so while working on my latest novel Fields of Lilac, I paused to write On Respect for Difference. Increasingly, I was forced to admit that it was not the stereotypes of race, class, gender, religion and so on, but respect for difference which should inform inclusiveness and thus become more socially meaningful. *In The Making of the Black Working Class in Britain, ‘Black’ is used as a political colour inclusive of Africans, Asians and other non-white people.